By RAYMOND J. PHILLIPS, JR. The literature dealing with the Socialist party in the United States invariably makes reference to three cities—Bridgeport, Connecticut; Milwaukee, Wisconsin; and Reading, Pennsylvania—which served as islands of Socialist strength while the national organization was experiencing defeat at the polls. 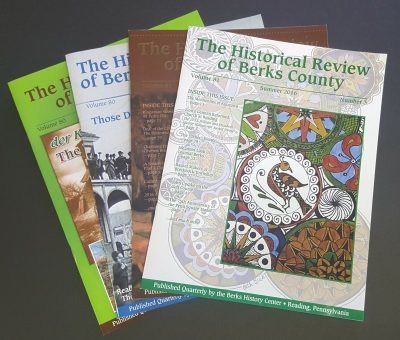 It is hoped that this article, which will be concerned with the Socialist era in Reading, will serve to remind the older citizens of Berks County of a political situation that has vanished from the scene and to familiarize the younger citizens of the area with a political situation which it was not their pleasure to experience. To anyone who is even vaguely familiar with the peculiarities of American politics, it is a well-known fact that third parties have generally been dismal failures in terms of electoral performance. However, the record of the Reading Socialists is an exception to this situation. Before the turn of the present century there were Readingites who affiliated in one way or another with political organizations outside of the two major parties. Among these were the People’s or Populist party, the Greenback party, Henry George’s Single Tax Club, and the Socialist Labor party. In 1901, the Socialist party was formed in Reading, and it received a charter from the national organization in 1902. Two years later, the Reading Socialists organized the Labor Lyceum which served as the head quarters for Local Berks of the Socialist Party. From that time until 1958, when the Socialist party appeared on the local ballots for the last time, the party experienced more than a third party’s usual share of electoral successes. Victory at the polls began in 1910 with James Hudson Maurer’s election to the Pennsylvania State House of Representatives and ended in 1943 with J. Henry Stump’s third election as Mayor of Reading. In the intervening years the Reading Socialists gained seats on the city council and the school board in addition to capturing various other city and county offices. The Party’s opposition to American involvement in World War I damaged considerably its reputation and standing, and it was not until 1927 when the party witnessed its first really significant local victory (to which reference was made in the national organization’s Thirty-Fifth Anniversary Journal in 1936) when their candidates won the mayorship, two council seats, two school directorships, and the office of city controller. In 1929, the party captured the remaining two seats on the city council and two additional seats on the school board. At this time Reading was the only city in the country whose council was completely controlled by the Socialist party. In 1930, Mrs. Lilith M. Wilson and Darlington Hoopes, Sr., presently national party chairman, were elected to the State House of Representatives to which they were returned in 1932 and 1934. The electoral successes of the Socialists were viewed with alarm by the leaders of the two major parties, and in 1931 they combined their efforts under what was known as the Fusionist ticket in an attempt to turn the Socialists out of city hall. The combined efforts of the major parties were successful in defeating the Socialist candidates in 1931 and 1933. However, when the two major parties returned to their usual role of opposition to each other in 1935, the Socialists scored their greatest victory during the entire period when they were active on the local political scene. The year 1935 was a landslide for the Socialist party when it captured the mayorship, three council seats, the offices of city treasurer and controller, three seats on the school board, a seat on the board of county commissioners, and two county prison inspector-ships. This was the most stunning blow the major parties in Reading had ever received at the hands of the Socialists. However, except for Stump’s election as mayor in 1943, it was to be the party’s last victory at the polls. These few introductory paragraphs should serve to illustrate that the Socialist party in Reading experienced more than merely one or two victories and that it played a more significant role than is usually accorded to a third party. The remainder of this article will now be devoted to a discussion of the factors leading to their success at the polls, to an examination of their conduct in office, and to a few concluding remarks concerning the significance and effect of the Socialists on the local political scene. The Socialist party in Reading was a labor-oriented organization. One writer has observed that it was sometimes difficult to determine whether the Socialists adopted labor or whether labor adopted the Socialists, but whatever the situation may have been, there was an exceedingly close alliance between the two during the Socialist era in Reading. A glance at the occupational backgrounds of the candidates of the three parties illustrates this point quite well. Eighty-five per cent of the Socialist candidates were drawn from the skilled, semi-skilled, or unskilled workers, whereas a like percentage of Democratic candidates and a greater percentage of Republican candidates were drawn from the professional, proprietary, managerial, and clerical groups. It is interesting to note that more Socialist candidates were engaged in cigarmaking than in any other single trade. The outstanding Reading Socialist, James Maurer, also served for sixteen years as the President of the Pennsylvania State Federation of Labor. Maurer’s leadership was no small factor contributing to the party’s success in Reading. Darlington Hoopes, Sr., the party’s 1952 and 1956 presidential candidate, has referred to him as a “born leader.” Maurer displayed his ability to win elections as early as 1910 when he was elected to the State legislature, and the national organization was cognizant of his capacity for leadership when he was selected as Norman Thomas’ vice-presidential running mate in 1928 and 1932. Older Readingites recall Jim Maurer as a forceful and persuasive speaker who had no peer on the public platform. In reading his autobiography, It Can Be Done, one soon discovers that here was a self-made man who believed in what he was fighting for, and more, that he had the indomitable courage to sacrifice everything he had in his fight for what he believed in. This writer offers the opinion that in the absence of Maurer, the Reading Socialists would not have been as successful as they were. While Mayor Stump was a highly personable individual, he was not a particularly effective organizer and administrator, and he depended upon the forceful leadership of men like Maurer to carry him through. The failures of the old parties also contributed to the success of the Socialists. These failures were exploited by the Reading Socialists who campaigned on local bread-and-butter issues, unlike many of the national Socialists who tended to engage in academic discussions of the doctrinal differences between the Socialists and the two major parties. On one occasion Mayor Stump, in speaking to a group of Socialists in Philadelphia, advised them to “Americanize” the party and warned them that the voters are not interested in abstract questions. The most important issue in the 1927 campaign was dissatisfaction of the citizens of Reading with the property assessments, and in the campaign the Socialists never permitted the voters to forget this issue. Undoubtedly, other factors contributed to the party’s success at the polls, but these three factors—the party’s close alliance with labor, Maurer’s forceful and dynamic leadership, and the exploitation of burning local issues—appear to have made the most significant contribution to the success of the Reading Socialists. All this sort of thing is not Socialism—perhaps not even a first installment. But it is part of a necessary preparation for Socialism. So long as people think that politics is in its nature corrupt, they are not likely to understand what Socialism means. Only clean political action can usher in the new social order. What, then, did the Reading Socialists accomplish during their tenure in office? As noted earlier, the outstanding issue of the 1927 campaign centered around property assessment inequities, and these were adjusted, albeit not to the satisfaction of the business community. Although the voters had approved a $750,000 bond issue in 1925 for the construction of a new city hall, the Democratic administration never issued the bonds. In 1928, however, the Socialist administration purchased an old high school for $510,000 and used the remainder of the bond issue to renovate the entire building which still serves as the city hall of Reading. The old city hall had become quite an eye sore, and on one occasion Maurer humorously referred to the building’s condition when he said the insect exterminators would come in on the ground floor and chase the bugs to the top floor, and then the exterminators would go to the top floor and chase the bugs back down to the ground floor. However poor the condition of the old city hall may have been, there was almost universal agreement at the time that Reading needed a new edifice for its municipal government, and this had also been recommended by one planning authority as early as the first decade of the present century. The Socialists also abolished the contract system for street cleaning and garbage collection, extended the sewage system into parts of the city that had never been connected, and rebuilt the sewage disposal plant to eliminate the dumping of raw sewage into the Schuylkill River. In addition, they established the city’s first central purchasing department, provided for the separation of adult and juvenile offenders, and constructed several playgrounds and recreation centers for children and adults. During the second Socialist administration, 1936-1940, they sponsored projects financed largely by the federal government, such as the airport and administration building and low-cost housing for four hundred of Reading’s low-income families. This administration also authorized a land utilization survey which served as a preliminary to the adoption of a zoning ordinance. In connection with this latter project it should be noted that at this time Reading was one of only two cities out of ninety in its class that had no zoning ordinances. The Socialists were never successful in gaining control of the Reading school board, but those who served as school directors were stanch supporters of education and an economical administration of the public school system. They advocated equality of opportunity for all school children and opposed all programs that were to be financed by special contributions from the patrons rather than through the medium of taxes. The Socialist directors always supported vocational education programs and objected to all activities that promoted militarism. From the preceding discussion it is obvious that the Socialists offered the people of Reading a good government program rather than an experiment in socialism. This is perhaps the reason why older Readingites still refer to the Socialist administrations as the best in the city’s history. In retrospect the Socialist era in Reading appears to be more representative of a municipal reform movement than of any type of radical experiment sometimes associated with Socialist organizations. The local Socialists, unlike many of the leaders of the national organization, offered a platform dealing with issues that were close to the people, and when in office the Socialists generally fulfilled their campaign promises. The decline of the Socialist party is apparent not only in Reading but also throughout the nation. In 1956 the Socialist party ran a presidential candidate, Darlington Hoopes, Sr., for the last time, and the Socialists appeared on the Reading ballots for the last time in 1958. Norman Thomas, the party’s presidential candidate from 1928 to 1948, has attributed the decline to Franklin D. Roosevelt and the New Deal. In Reading, too, it appears that the Democratic party has had a stronger appeal for the younger generation than has the Socialist party, as is seen, for example, by Darlington Hoopes, Jr.’s affiliation with the local Democratic organization. Today, the Reading Socialists number about twenty-five members who meet monthly in the law offices of Darlington Hoopes, Sr., and the local organization continues to sponsor a public speakers’ forum in the Reading YMCA on Sunday evenings throughout the winter months. That, however, is about the extent of their activities, for the party’s headquarters were razed several years ago to make way for an urban renewal project, the Socialist Park in Sinking Spring has already been sold, and the local courts have been presented with a petition seeking permission to dissolve the local organization and to distribute the assets of approximately $75,000 among the living members. Although the Socialist party is no longer an organization of any political consequence, it has left behind a legacy of which any political party could be proud. The Socialists established the first purchasing department in the city’s government, and it is still an important department at city hall. The Socialists also abolished the contract system for providing various city services and replaced this with permanent municipal employees. Parks and recreation areas were constructed by the Socialists, and their administration provided the basis for the city’s first zoning ordinance. And today a former Socialist, George M. Rhodes, represents the area in Congress. This article originally appeared in the Summer 1965 issue of the Historical Review of Berks County.